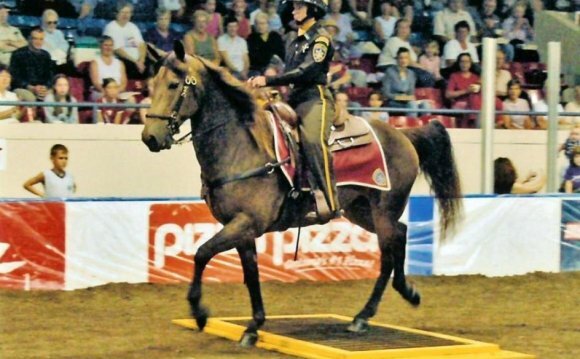 In 2001, through participation with the National Police Horse Colloquium at the Kentucky Horse Park, Asbury students began training Percheron Thoroughbred crossed horses to be used for police mounts. The colts are started with ground lessons of imprinting and leading, as well as round pen exercises and de-sensitization to various objects and obstacles. As two year olds, they are ridden, learning their balance with a rider at the walk, trot and canter, then advance to more strange noises and obstacles. They continue to be trained up through age three or four years and then are sold to police units for mounted officers. All Asbury Police mounts are geldings and hand-selected for their calm dispositions. They are trained by the university students of the Asbury University Equine Program. Our goal is to produce safe, reliable mounts ready for active duty. Currently, Asbury University is the only university in America with a police horse training program conducted by the students. "We are pleased with the leadership opportunity this provides for our students, " says Harold Rainwater. "It's a wonderful way they can be involved academically in cutting edge programming within the horse industry."